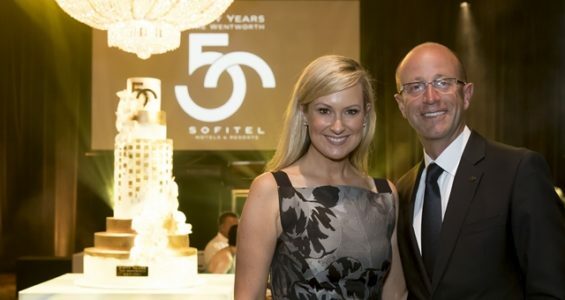 The Sofitel Sydney Wentworth were Celebrating their 50th Anniversary and needed a little something special to suit the prestigious and glamorous event. They were in search of a Main stage as well as a podium to compliment the spectacular cake positioned in the heart of the room. 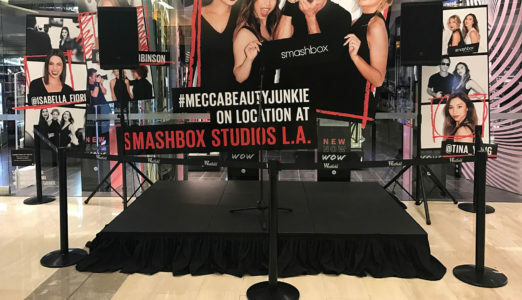 The popularity & success of the Mecca Maxima brand is evident, with new stores and promotional events happening all over. Every event is exciting and completely unique so being flexible and tailoring to their needs is what keeps them coming back. Seven years running we have been the proud suppliers, installers & operators of the sound & lighting for the Lifesavers with Pride Mardi Gras float. We were ecstatic to assist Biliini showcase their 2017 Summer range at “The Ivy” in Sydney. An all white, sophisticated, modern backdrop ensuring the product remained the focal point was paramount. 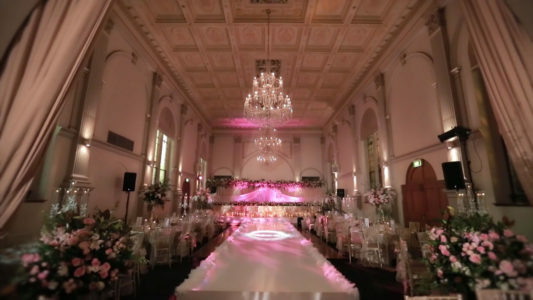 Xpert Wedding came to us with a client planning a very lavish style look to her wedding day. They needed a bridal riser with a twist. They were wanting to extend out from the bridal riser into a catwalk style stage the length of the guests tables. We suggested a custom white sleek stage to compliment their gold, pink and white theme. Tenpin city contacted us in relation to a grandstand for an ongoing international bowling competition. The available space was limited & being televised worldwide the Director stressed it had to look good. Contacting us via our online enquiry form looking for a catwalk, Ailing sent through a photo from our website gallery and rough sketch of the space she had to work with. We encourage clients to send through any images and drawings they may have or even photos from our gallery to ensure we understand how they want their event to look. 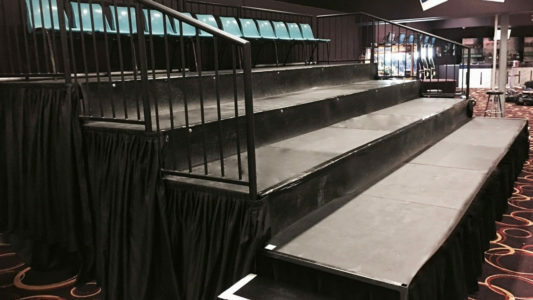 Requiring a stage for a graduation ceremony, The NSW Sheriff’s office contacted Stage & Sound Australia after researching the various staging products on the market. The priority was that the stage have little to no movement and a solid marching sound, with up to 30 graduates marching up one side, across the stage and down the other. 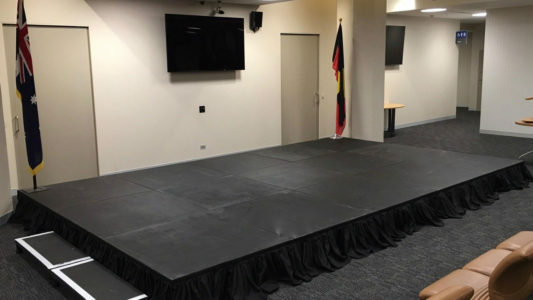 Stage and Sound Australia would love to help you with your next event. Big or small let’s make it great together!